$24 a night is all it cost for Nathan and I to stay in Vegas. We drove out there Monday morning and stayed through Wednesday afternoon. We stayed at Excalibur. When we first got there we walked over to New York, New York for lunch. We kinda relived our New York experience. We had a pastrami on rye sandwich. We then changed into our bathing suits and sun bathed until we could check into our room. I promise, I am wearing a bathing suit. It's a bandeau. For dinner we went to Grimaldi's Pizzeria. The original is in Brooklyn N.Y. and unfortunately Nathan and I failed to go there while we were in New York, so we were happy to find out there is one in Las Vegas. The pizza is delicious. 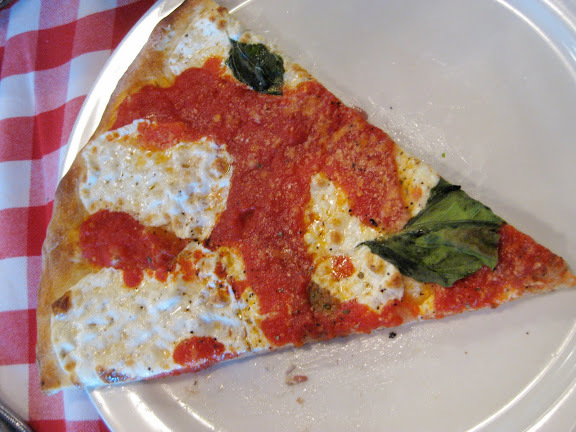 The mozzarella is soft, the sauce is sweet and it is sprinkled with fresh basil. As for the dough, it can best be described with a quote from Eat Pray Love. It's soft and chewy and yielding, but incredibly thin. I always thought we only had two choices in our lives when it comes to pizza crust-- thin and crispy, or thick and doughy. How was I to know there could be a crust in this world that is thin and doughy? Holy of holies! Thin, doughy, gummy, yummy, chewy, salty pizza paradise. I love the authentic checkered Italian table cloths. After dinner we did some shopping. We checked out the Ross in Las Vegas and realized how much better the merchandise is than ours. I bought a new, cute Nine West purse. We went to Walmart and I bought the book Eat Pray Love to read at the pool. I am really loving it. To finish off our New York experience in Las Vegas, we went to Caesar's Palace where they have a Serendipity and we had some Frozen Hot Chocolate. Unfortunately, we got there a little too late so they wouldn't seat us in the restaurant so we had to get it to go, so it was in a big plastic cup...not quite the same, but still yummy. Tuesday we woke up and went down to the pool for a few hours. We took a break for lunch and then went back out for a little more sun. That night we went to see Eclipse, and then we got dinner at America in New York, New York. Wednesday we woke up checked out and then and went down to the pool for a few hours before we drove home. We engaged in a conversation with two older gentlemen from London. I loved listening to their accents and their idioms. We then changed, got in the car and came home to out doggies. I was a nice little get away. Sounds like you had a delicisous time! Dad and I have fond memories of having fun in Las Vegas.